Replaces the Wolf and Snow Wolf Helmets with a ferocious wolf head with gaping jaws. You can do whatever you want with this mod but all I ask in return is that you give Psymoniser credit if you use/modify the meshes, and give me credit if you use the icons. If you have any questions, contact Psymoniser or myself. The new mesh is a modification of the wolf creature head (a Bethesda-made mesh). Therefore, you may not legally import this mesh into another game (such as TESIV) and distribute it as a mod. Thanks to Psymoniser for making the beautiful new wolf helmet mesh! And even more thanks for continuing to help work on the mesh. 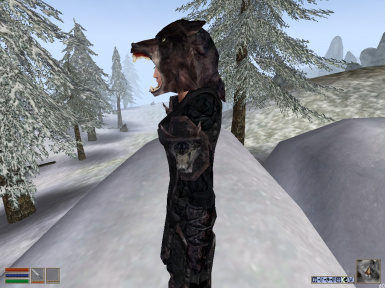 Replaces the Wolf and Snow Wolf helmets with a fierce wolf head in the same style as the Bear and Snow Bear helmet meshes. You can now brave the wilds of Solstheim without looking like a bird took a crap on your head! - Uses the vanilla wolf and snow wolf textures. - Includes new icons with working transparencies. 4. Start Morrowind and play. This mod will conflict with another mod that changes the icon or mesh for the Wolf and Snow Wolf armor helmets. 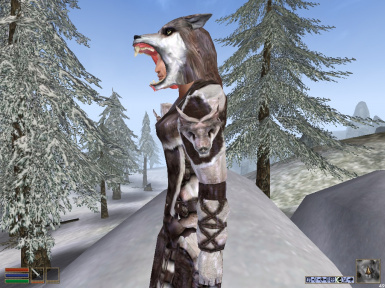 This mod Will NOT conflict with a texture replacer mod that changes the Wolf and Snow Wolf creature textures. This mod will NOT conflict with a mod that changes the stats/item properties of the Wolf and Snow Wolf helmets. It is possible that there might be clipping with some heads. If there are any other bugs or issues, please let me know. 1.6, 2010/5/01 - updated the icons. 1.5, 2010/1/15 - Updated with a new and improved mesh! 1.0, 2010/1/11 - Initial release.